The North Carolina Museum of Art developed a learning management system in support of new distance learning programs. These distance learning programs aim to deepen and activate the learning experience before, during and after a museum visit. 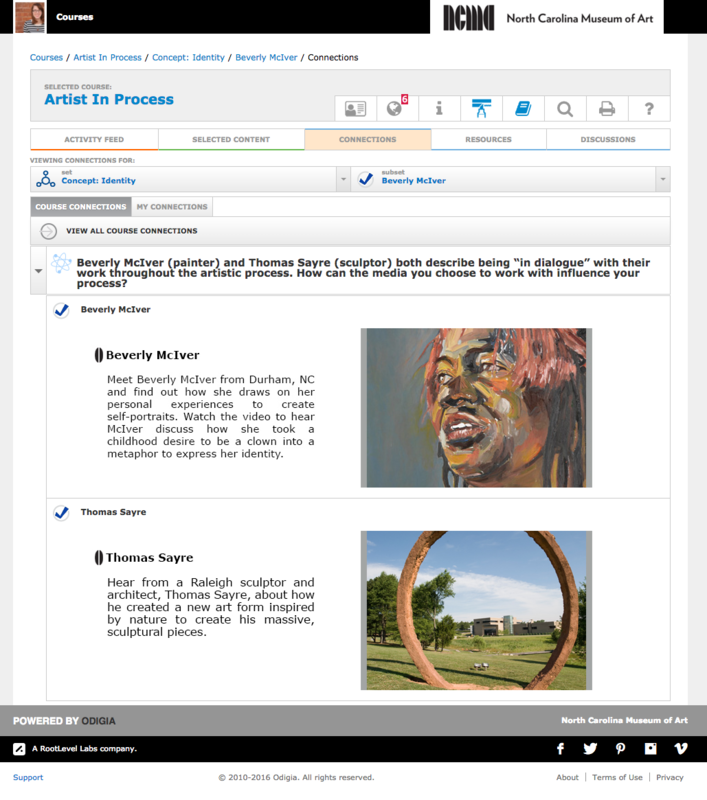 As the state art museum, providing online courses enables the NCMA to better reach and engage a statewide audience. Since our first course in Odigia in 2015, over 600 students and teachers have interfaced with this newly designed LMS.The platform has supported new approaches to delivering online experiences through Flipped Museum programs for high school students and blended professional development for teachers. For teachers enrolled in professional development opportunities, the online course allows teachers to engage in high quality programs through the NCMA that is flexible and fits their busy schedules. In 2014, we partnered with a company from Winston-Salem, North Carolina, to customize their Learning Management System. The goal of this new system was to improve on the user experience of a traditional LMS and help achieve. specific learning outcomes of and active, self-directed learning experiences. We had used other LMS’s before such as Moodle and Blackboard but did not feel that those helped users achieve our learning outcomes. We wanted to create a visual and social experience for students (See Figure 1). 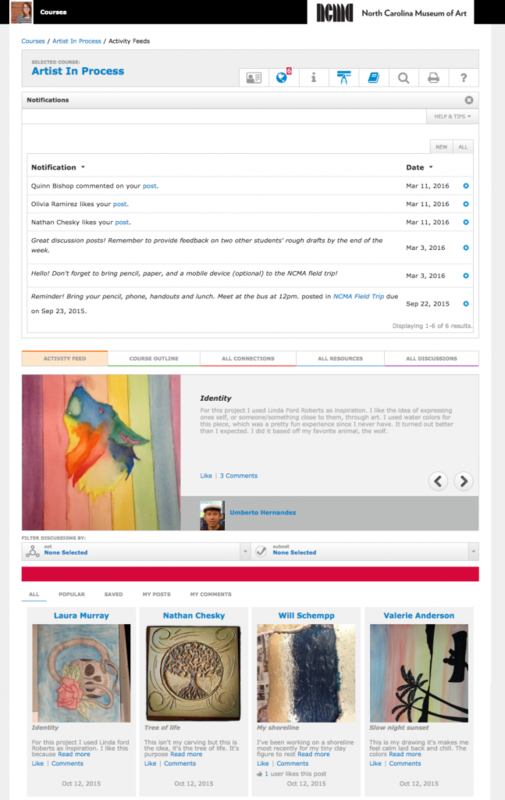 As soon as students log in, they see Featured Posts at the top of the page. They can scroll down and interact with a Pinterest-like news feed of the most recent posts. They can Like and Comment on each others work as a way to foster dialogue between students. 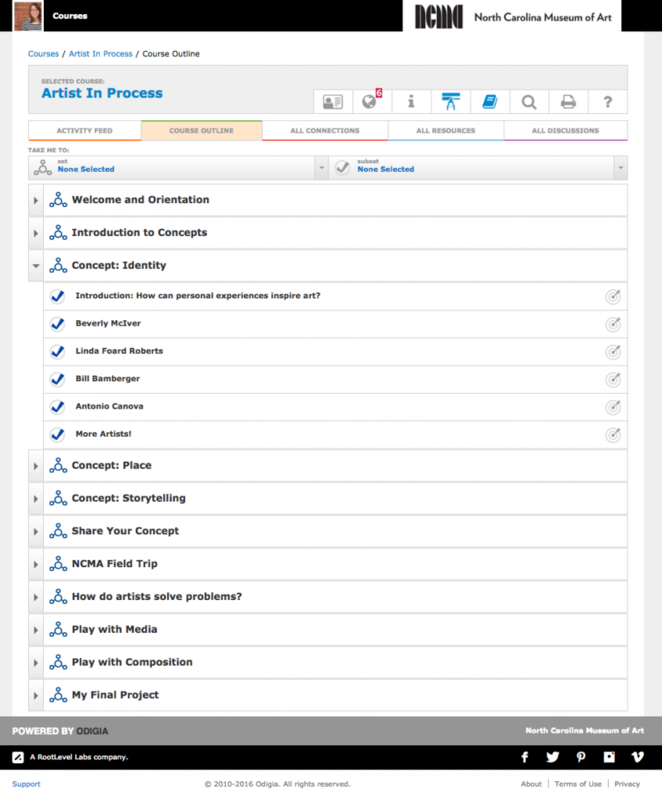 The Notification tool (See Figure 2) allows teachers and museum staff to communicate updates or announcements to students. It also lets students know when someone has commented on or Liked their post. Once learners go into a Subset, they can engage with written and multimedia content as well as Resources that provide further knowledge about the content in that Subset (See Figure 4). The Connections tab is an additional feature that supports deeper engagement with course material. This feature enables learners to identify and analyze connections between content throughout the course (See Figure 5). A museum staff person can create connections or learners can create their own. Feedback generated from both teachers and students reflect the positive impact of being able to actively engage in dialogue with their peers. 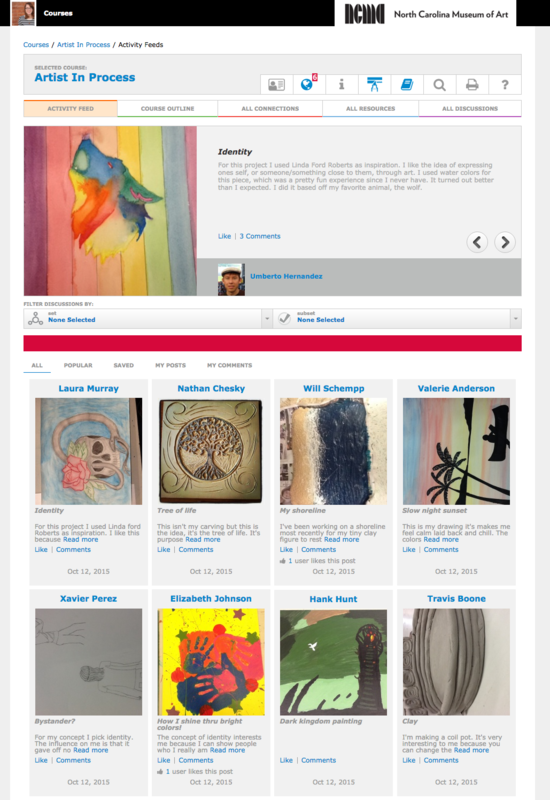 It provides an opportunity for students and teachers from across the state to share their thoughts about art, get feedback on projects and develop a community of learners, as well as connect with their state art museum.